Take a 2-day tour Hanoi to Halong Bay by bus or airline, you will find the most strange feeling in one of the destinations in UNESCO World Heritage Site. High recommendation for you is to travel on the cruise as its best services for travelers and to relax each evening in comfortable, air-conditioned cabins. The tour can be more amazing when enjoying it along with caring services of luxury cruises: fresh seafood, spa services, bars, and adventurous activities on the beach. It ensures that you will enjoy a 2-day trip to the amazing destination in Vietnam. On a cruise, you not only grace the stunning landscapes on the beach but also enjoy the delicious seafood suppers, and get a cookery demonstration of traditional Vietnamese cuisine. You will relax on board, or snorkel, and swim in refreshing waters. Besides, you also join the activities and sleep on board. Moreover, the trip continues discovering the floating villages, which helps you more understand about the local people. 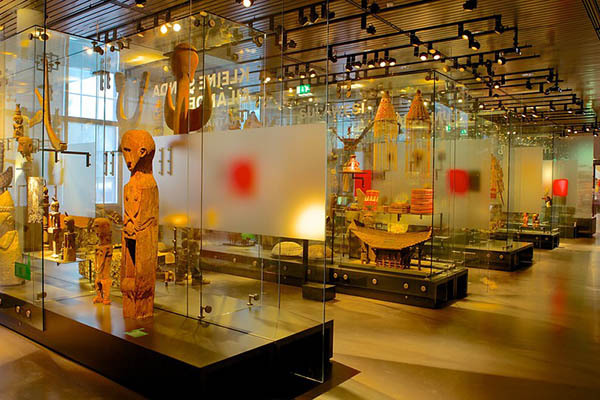 Before visiting Halong Bay, if you have a free day, you should discover several famous destinations in Hanoi capital such as Ho Chi Minh complex, Hanoi Old Quarter, Hoan Kiem Lake, Literature Temple, and Ethnology museum. At 7.30 a.m: You will be picked up at your hotel and transfer to Noi Bai airport if you getting Halong Bay by airplane, or go straight to Halong. Spending 4 hours on the road, you will arrive in Tuan Chau island. After that, following to your tour guide, you check in the cruise and enjoy our Welcome Cocktail upon boarding and have buffet lunch while the Cruise hangs around hundreds of islets to discover the unspoiled magic of Halong Bay beauty. A meal in the lunch includes many delicious Vietnamese foods and great drinks. On the beach, the junk moves slowly toward Bai Tu Long Bay.In the afternoon, following the tour Hanoi to Halong bay, you cross the towns of Hon Gai and Cam Pha, Oan Lagoon, Monster Head, Teapot Islets and Thien Canh Son Cave. The travel route to Thien Canh Son Cave is going through thousands of limestone islands, islets and hundreds of small sandy beaches. Thus, you have the feeling in the paradise with a wonderful beauty of stalagmites and stalactites – an image of a lotus, a picture of a baby elephant. The ceiling of the cave is covered with a layer of shiny ‘carpets’, numerous sparkling stalactites appear like “hanging lamps”. Besides, you discover the geological value of the bay, and to enjoy the strange cave. In the afternoon, following the tour Hanoi to Halong bay, you cross the towns of Hon Gai and Cam Pha, Oan Lagoon, Monster Head, Teapot Islets and Thien Canh Son Cave. The travel route to Thien Canh Son Cave is going through thousands of limestone islands, islets and hundreds of small sandy beaches. Thus, you have the feeling in the paradise with a wonderful beauty of stalagmites and stalactites – an image of a lotus, a picture of a baby elephant. The ceiling of the cave is covered with a layer of shiny ‘carpets’, numerous sparkling stalactites appear like “hanging lamps”. Besides, you discover the geological value of the bay, and to enjoy the strange cave. In the first evening: On the cruise, you should attend the cooking class to learn how to cook traditional Vietnamese foods. Besides, it is time to relax by join the activities like film entertainment, light music for dancing in the dining room (please book in advance with your tour guide), board games and playing cards are available, and massage services are available. Additionally, you may also try squid fishing and fishing from the boat. 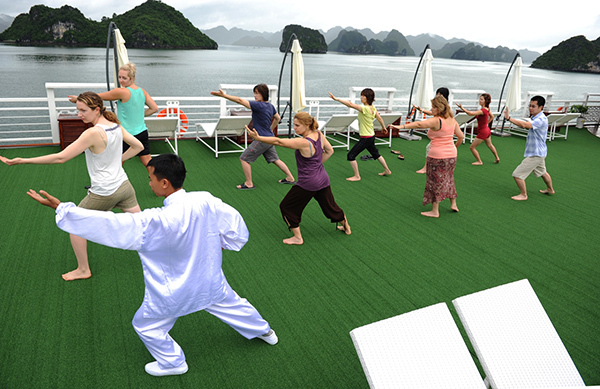 The day starts early onboard with Tai Chi session on the sundeck. Tai Chi is a combination of deep breathing and relaxation with slow, deliberate movements, meditation, and breathing exercises. Tai chi is very good for your healthy and safe for all ages and fitness levels. This session is a great benefit for relaxation and wakes up your body in the morning. It is a very practical way for you to refresh from a mind. 8.00 a.m: Another destination you shouldn’t miss in the tour Hanoi to Halong Bay is the Vung Vieng Village by bamboo sampan for an hour into the village. You have a short visit to Pearl Farm to learn how natural pearls are created and return to Paloma Cruise for your leisure or join one of the following optional activities: Sunbathing, traditional massage, swimming and so on. Upon return to the boat, you will have 30 minutes to freshen up and finish packing. At 6.00 p.m: You come back to Hanoi and finish the awesome trip in Halong Bay. How to Get the Best 2 Days Halong Bay Tour from Hanoi? 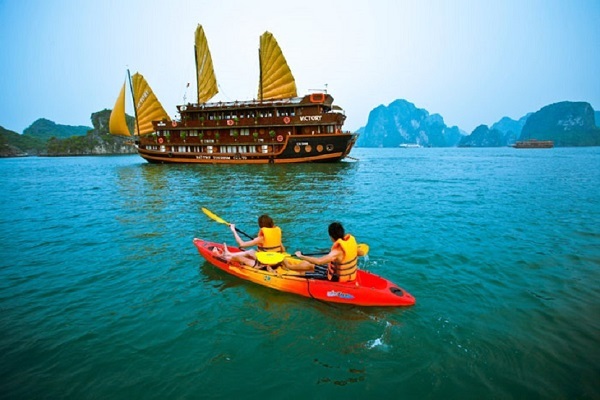 What Is the Best Tour in Hanoi Vietnam Halong Bay? How to Get the Luxury Halong Bay 1 Night Cruise?